Historically, Korea has long been known as a land of great mineral wealth. Gold was, and still is, found scattered throughout the peninsula. But it is not only the wealth found on land that has attracted fortune hunters but also the fabled wealth that lies hidden in the seas. Over the past couple of years, there have been several accounts of "gold ships" discovered around Korea. Except for their archaeological value, none of these ships has yielded much wealth; in fact, they have proven detrimental to their discoverers. One such treasure ship was the Kowshing. On July 23, 1894, the docks at Taku, China, were busier than normal. Vendors called out the virtues of their wares -- mainly watermelons and large cakes -- and the exited chattering of the new soldiers and the bellowing of their commanders filled the air. The soldiers, dressed in traditional Chinese uniforms, carried an assortment of weapons that almost looked comical. Many carried old Austrian muskets, Martinis and Tower rifles but often with incorrect ammunition. Others were armed with ancient weapons, mainly bows and arrows and long spears. Perhaps more surprisingly, many of the officers went about with large fans and umbrellas. Many of the Chinese soldiers were not even real soldiers, but coolies who had enlisted at the last moment, or boys anxious to participate in the Chinese expedition to Korea. The Chinese government was supporting the Korean government in putting down the Tonghak Insurrection -- a rebellion that broke out in the southern provinces of the peninsula and quickly spread throughout Korea. The Japanese also reacted by sending more than 7,000 troops to defend Japanese interests in Seoul and Chemulpo. The sudden infusion of foreign troops into Korea made the country even more unstable -- especially considering that China and Japan were vying for more influence in Korea. Captain Thomas Ryder Galsworthy, commander of the steamship Kowshing, looked down upon the deck of his ship as his crew prepared to load their latest shipment -- four battalions of Chinese infantry and artillery soldiers (a total of 1,100 men), 10 old-fashioned mountain guns and a supply of rifles and ammo. Galsworthy was unsure of his destination -- his orders were sealed in an envelope that he was to open once at sea -- but he was confident that he was bound for Korea. Galsworthy was unaware, that the Kowshing was one of 10 ships that had been chartered by the Chinese government to transport troops and equipment to Korea. Three British-flagged ships were to proceed to Asan, Korea, while the remaining seven Chinese-flagged ships were to proceed to the northern part of Korea near the Chinese border. A few days ago, on July 19, Japan had warned China that any additional deployment of Chinese troops to Korea would be viewed as a hostile act. It has been speculated that the Chinese sent the British-flagged ships to Asan assuming that if they were discovered, the Japanese would not attack them because of their flags and let them pass through. They were wrong. That night, under the cover of darkness, the Kowshing left Taku, the last of the three British-flagged ships bound for Korea. Prior to departing, a German national by the name of Major von Hanneken boarded the ship. He claimed to be nothing more than a passenger (the only passenger) and was bound for Korea. 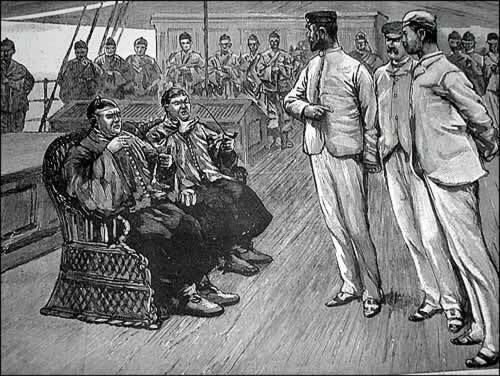 Despite his claims, Galsworthy and the crew noted that their "passenger" spoke excellent Chinese and was shown a great deal of respect by the Chinese soldiers and sailors. Major von Hanneken was actually an employee of the Chinese government and was most likely going to Korea to act as an advisor for the Chinese. Major von Hanneken, Tamplin, and Captain Galsworthy from Graphic Newspaper, Nov. 3, 1894. 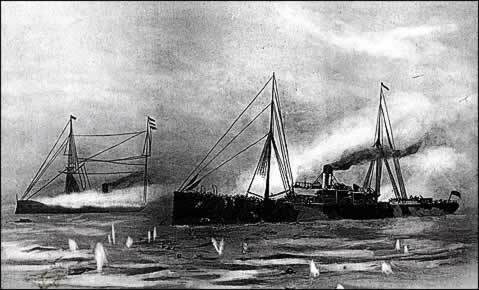 The Kowshing sailed throughout the night encountering no ships until the following morning at 7:30 when the crew noticed a warship sailing away from Korea at full steam. It was flying the Japanese flag and, surprisingly, a plain white flag. Captain Galsworthy thought it was a Japanese warship and ordered the Kowshing's ensign dipped as a sign of respect, but the warship did not seem to take notice and continued on its way. At about 9:00 a.m., near Pung Island off the coast of Korea, the Kowshing encountered three Japanese warships: Akitsushima, Yoshino and Naniwa. The Japanese warships fired two warning shots over the bow of the Kowshing and demanded that it "heave to or take the consequences." Captain Galsworthy readily complied. While the Japanese commanders, who seemed to be confused, conferred among themselves on their own ships, Captain Galsworthy and Major von Hanneken talked anxiously among themselves on the Kowshing. The Chinese generals had made it clear that they would not be captured by the Japanese and preferred to go down with the ship. Galsworthy and von Hanneken were fairly sure that the Japanese would not attack a British-flagged ship, so they thought it prudent to wait rather than attempt to outrun the Japanese warships. Within a short period of time, two of the Japanese warships departed leaving only the Naniwa to deal with the Kowshing. The commander of the Naniwa was Captain Togo Heihachiro (who would later go on to be one of Japan's greatest admirals), a young Japanese officer who had been educated in England. Togo sent a boarding party to ascertain the Kowshing's ownership and destination. The arrival of this boarding party caused great excitement aboard the Kowshing, but von Hanneken was able to keep the Chinese occupied while Galsworthy explained the Kowshing's situation to the Japanese. The Japanese officer informed Galsworthy that the Kowshing was to follow the Naniwa to Japan where the Chinese would be made prisoners of war. Galsworthy argued that war had not been declared and that the Kowshing should be allowed to return to China. The Japanese boarding party returned to the Naniwa and signaled for the Kowshing to follow. 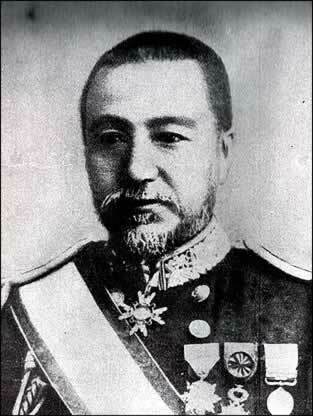 Admiral Togo -- from the North China Herald newspaper, 1894. Galsworthy and von Hanneken tried to reason with the Chinese generals that they had no choice but to surrender to force majeure. The Naniwa, they argued, could sink the Kowshing with just one shot. The Chinese generals argued illogically that they had more than 1,100 men while the Naniwa had at the most 400 -- they would not surrender. To ensure that Captain Galsworthy and his crew would not surrender, the Chinese generals commanded that they be guarded by armed soldiers who would kill them at the first signs of deceit. At 12:40 p.m., after nearly two and a half hours of negotiations, the Naniwa hoisted a red flag, sounded its siren and then fired a torpedo. It is uncertain if the torpedo actually struck, but the subsequent broadside by the Naniwa's five large main guns and deck machineguns doomed the Kowshing to a watery grave. 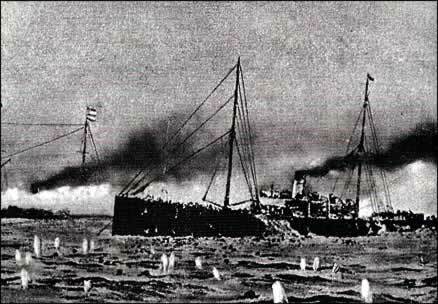 Photograph of the Kowshing sinking. Major von Hanneken described the attack: "The torpedo arrived at its aim; it hit the ship amidships, probably exactly at her coal bunkers." A loud explosion followed and "day became night; coal, splinters [and] water [filled] the air." 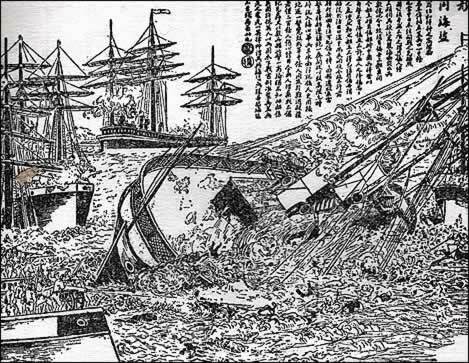 As the Kowshing began to sink, many of the Chinese soldiers jumped overboard and tried to swim to the nearby islands, while others managed to scramble into a couple of lifeboats. The Chinese who were unable to swim or find space in the lifeboats chose to remain aboard the Kowshing and fired upon the Naniwa with their small guns. Some, allegedly, fired upon their fleeing comrades "probably having the savage idea that if they had to die, their brothers should not live either." The Japanese continued to fire upon the Kowshing until it finally sank in 11 fathoms of water. Japanese sailors were then sent out in small boats in an attempt to rescue any of the Kowshing's crew that might have survived. They successfully rescued three members, including Captain Galsworthy, and returned them to the Japanese warship where they were provided with clothing and food. As for the Chinese soldiers in the water, they were mainly ignored by the Japanese and allowed to fend for themselves. There are, however, allegations that some Japanese sailors shot into the over-filled Chinese lifeboats sinking them and killing the helpless Chinese soldiers. Over the next couple of days, several hundred Chinese soldiers and Major von Hanneken were rescued by French, English, German and Korean ships, but the death toll was huge -- nearly 800 Chinese soldiers and most of the Kowshing's crew had perished. The sinking of the Kowshing "War in the Far East" by E. Sharpe Grew. When news of the attack was received in Chemulpo three days later, William Henry Wilkinson, the British Consul General, described the Japanese attack as murder, "for that it amounted to -- my countrymen and some 1,500 subjects of His Chinese Majesty." Wilkinson further went on to say that he felt "admiration for the courage shown by the Chinese troops, who preferred death to the dishonor of being made prisoners by their cowardly assailants." The Japanese had left the "helpless Chinese to perish of starvation on the crosstrees [of the Kowshing's mast] or fall a prey to the sharks below them." He was not the only one to feel so strongly. Others described the incident as "a savage massacre" and "as an act of piracy on the high seas." Vice Admiral Sir E. Fremantle, commander of the British fleet in the Far East, suggested to the Admiralty that Britain "should demand immediate arrest and suspension from duty of the captain of the Naniwa and senior officer commanding [the] ships engaged, pending negotiations between the two governments and failing to comply that I should be authorized to make reprisals." Of even more import was the need to "redress [the] insult to [the] British flag." 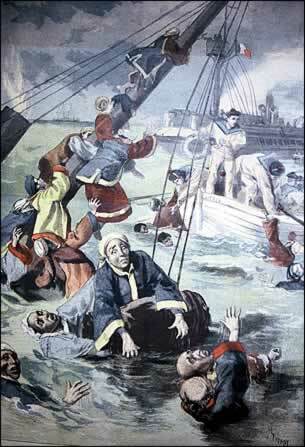 Chinese woodcutting of the sinking of the Kowshing. And looked their fate, like Britons, -- in the face! Heroes they died, -- each Briton where he stood! For vengeance -- by the God of Battles given. Glory to England! Honor to the brave! At rest for ever in their heroes' grave! The incident threatened to cause a serious rift in British-Japanese relations. Many felt that the British government should demand an apology from the Japanese government for the "unprovoked" attack upon a British-flagged ship or at least pay restitution to the families. However, two professors of international law, who were greatly vilified by the British public, argued that even though the Kowshing was a neutral ship and flying the British flag, she was nonetheless transporting soldiers of a belligerent nation. As an isolated vessel, the Kowshing was subject to being stopped and searched by the Japanese and if found carrying contraband could be seized. Because the Japanese were unable to put aboard a prize crew, they were within their rights to use whatever force was necessary. The Lion rescues survivors from the Kowshing. Eventually, the British government ruled, much to the astonishment of a large part of the British public, that the Japanese were justified in their attack. The demands for restitution continued for several years but eventually were laid to rest and the incident became just another anecdote in history books. For over 100 years the wreck of the Kowshing lay undisturbed. In the spring of 2000, the Korean salvage company, Gold Ship, began excavating the site. Chun Jung-woo, vice president of Gold Ship, announced to the media that, according to historical records [newspaper articles from 1920s] and undersea probes, the Kowshing had aboard some 600 tons of silver nuggets. "If the reported nuggets turn out to be not just lumps of silver but minted coins, their value could reach 10 trillion won [valued at US$7.6 billion in 2001]." The company did not explain how the Kowshing had remained unsalvaged by the Japanese during their occupation of Korea, even though its location in relatively shallow water was well known. It also overlooked that the small ship was filled with weapons, horses, men and ammunition and could not have possibly carried that much silver. After two years of ripping the ship apart in search of the silver, Gold Ship was forced to accept the truth -- the Kowshing was not a "treasure ship." The only silver recovered was in the form of six Mexican silver dollars (a standard currency used in Asia at that time), six ingots and seven spoons. In addition to the silver were seven boxes of skeletal remains, nine rifles, glass and porcelain fragments, and seven gold spoons. What became of these items is unclear. Ironically, the only true treasure was the ship itself -- a historical and irreplaceable relic destroyed by the greed of the present.